What makes the Corolla stand out from the crowd? It starts with the sporty front fascia. It's aggressive and totally loaded with attitude. When you see it coming at you from the front, you will see it means business. Catch it from the side for a dynamic show. Every angle maximizes its beauty, its power, and its performance. Available 17-inch alloy wheels brings the Corolla's design up several notches. They are eye-catching, drawing the eyes of everyone when at rest. They also enhance performance, keeping the eyes on target when it rolls out and shows off its power and style. 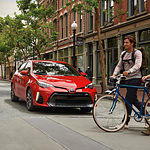 Come by Country Toyota to test drive the Corolla for yourself.